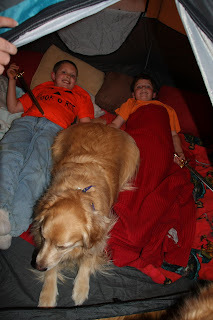 Saturday night after Spook-o-ree the boys slept in a tent in our family room. They thought is was great. 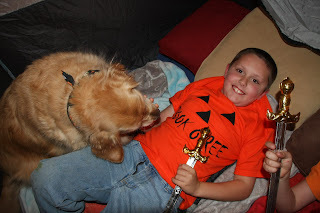 Logan wanted to sleep with the dogs. Well Mira got hot in the tent about 30 seconds after the pics were taken. Then about 3:45am Ryan starts screaming for me, I figured nightmares from the haunted trail, well no, he was then yelling "Violet keeps attacking me." She decided he had slept long enough and it was time to play, so she had to go back to her cage. All in all the boys seemed to really enjoy it. 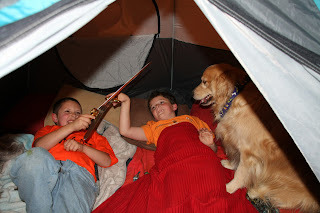 I am impressed the dogs stayed that long in the tent! I don't know of too many that would like it! Glad the boys had fun. how fun!!! 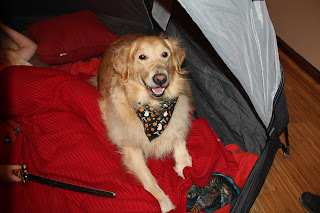 I wanna do that for Daws.......how do you set up a tent in your livingroom??? What holds it......I know nothing about that stuff! That looks cozy! How fun! i love it when dogs want to join in on the fun!! that is one of the best things about dogs.